In April, my work sent me to Valdez, Alaska to establish a communications center to support the clean-up of the largest oil spill in United States history. But I quickly discovered that Valdez was not ready for emergency dispatchers. The radio lines were not connected, the repeaters were not installed, and nothing was operable yet. The town was a madhouse of bureaucratic red tape. Every agency present (including Exxon, the Coast Guard, the state Department of Environmental Conservation, the Office of Emergency Service, the Alaska State Troopers, and the Alaska Pipeline Company) had its own headquarters. No one was eager to cooperate. Valdez was overrun with Alaskans and people from the Lower 48, all looking for work. Many of those working were being paid to do nothing but go to meetings and order new equipment. It was said in town that Exxon was spending $7 million per day – loose change for a company that makes $1 billion every quarter. Exxon had resolved to throw money at the problem, and there were plenty of eager hands reaching out to grab it. I explored Valdez to see the clean-up efforts firsthand. I began by making a heartbreaking visit to the bird rescue center. First stop was an entire trailer full of dead bird. The few birds that had been cleaned were still trying to preen and remove oil from their feathers, ingesting the lethal substance in the process. I saw loons, murres, cormorants, even a bald eagle struggling to survive being poisoned. 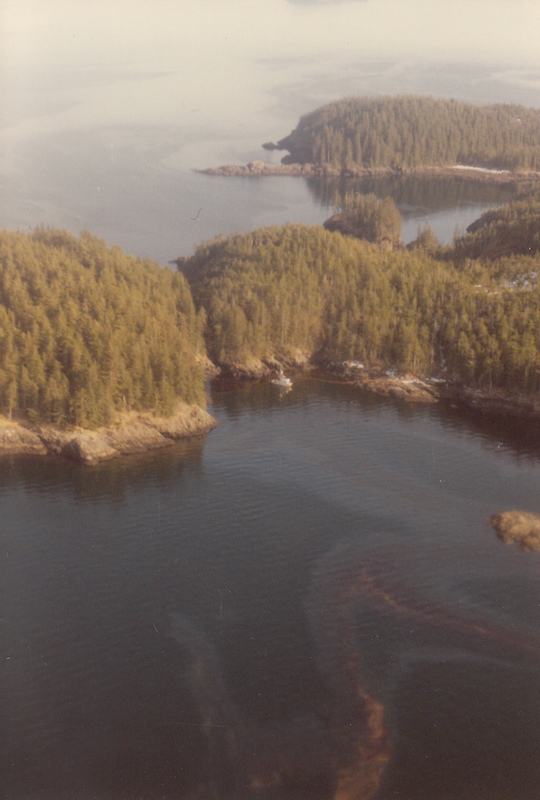 Most of the birds were never even pulled from the water; immersed in the oil slick of Prince William Sound, they sank like stones to the bottom of the sea. The atmosphere at the bird rescue center was desperate, for the workers (the only people in town who were volunteering) seemed to sense the futility of their task. I attended a “town meeting” staged by an Anchorage television station in the Valdez Civic Center. A panel of representatives from the Coast Guard, the Department of Environmental Conservation, Veco (the company contracted by Exxon for doing the clean-up) and the mayors of Valdez and Cordova fielded questions, live and on camera, from a studio audience. Most of the questions centered on money: How can I get a job? How do I file my fisherman’s claims? On Thursday, two other dispatchers and I were told to go out to the airport and board a helicopter for a flyover of the oil spill. 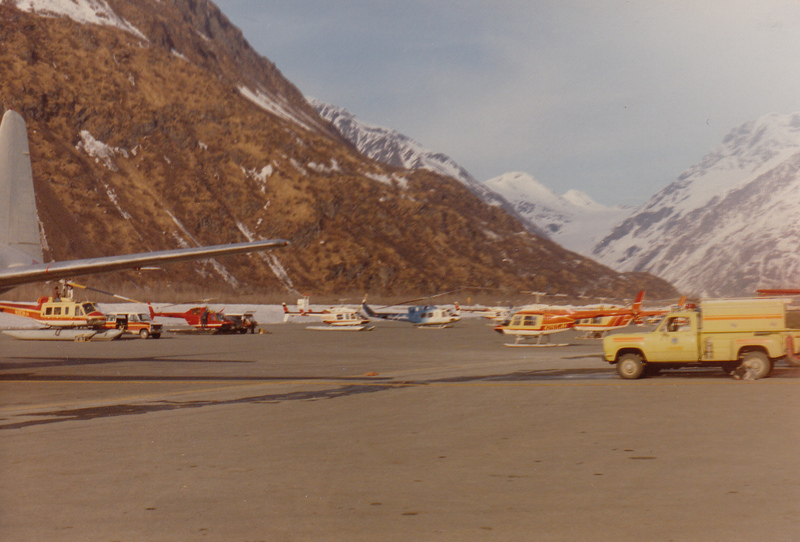 Normally, the Valdez airport has three or four flights departing per day. But since the spill, that number had risen to 500. The helicopters were lined up like cars in a shopping mall parking lot the week before Christmas. Our helicopter left Valdez, and we flew along the narrows which lead out to Prince William Sound. Up-current from the spill, where no oil had reached, I saw huge flocks of seagulls, many bald eagles and sea birds floating on the gentle swells. Otters and sea lions dove into the turquoise water, and the herring roe glowed milky white just beneath the surface. 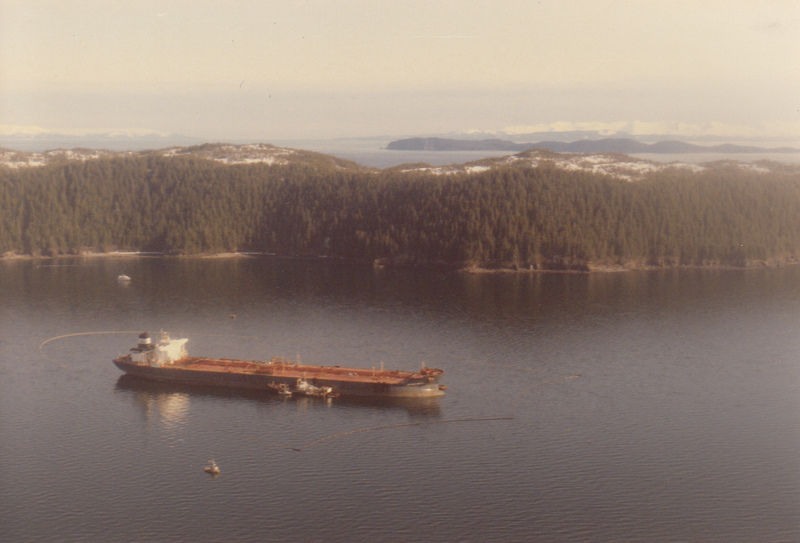 Then we came to Bligh Reef, where the tanker Exxon Valdez ran aground on March 24, spilling ten million gallons of North Slope crude oil into the pristine waters. From there south, the water was streaked black, brown, green, red, and blue, topped by an iridescent sheen of oil. Beneath the ocean surface I could see huge globules of oil; for ten fathoms down, the crude was as thick as molasses. We saw boats frantically trying to lay booms across a back bay to prevent the oil from reaching the salmon streams. The boats and the boom lines looked tiny against the expanse of oily ocean. There would be no way to hold back the mess. 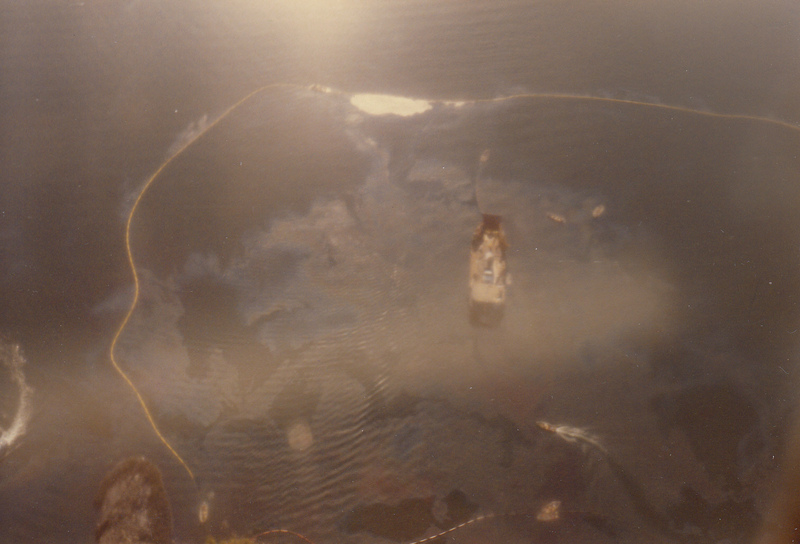 Ten million gallons of crude oil had, in three weeks, slimed its way into every corner of the sound. It would never be the same. The smell of oil and death was everywhere. Nothing moved, nothing lived in Prince William Sound. Beaches were black to the high-water mark. Workers went out at low tide to scrub individual rocks, while photographers’ cameras clicked. After they returned to town, the tide came in to redeposit the oil. The work was useless. The next day, one of the chiefs came into our communications center to tell us that it would be the middle of next week, at least, before any of the radios worked. He cut us loose for the weekend and told us to come back Monday. I said I was going home and they could get a different dispatcher from Soldotna to take my place. If there had been something to do, I would have stayed. But it was way too late for me to be of any help at all, to the birds, or the fish, or the beaches. I had always been an advocate for the preservation of wilderness and wildlife and letting natural things be, but since moving to Alaska I had become complacent. I read about smog and dead rivers and barges dumping toxic waste into the sea, but I never gave it more than a passing thought because it wasn’t happening in Alaska. Only now, it is. Driving home from Valdez, I stopped on the highway to let six caribou cross. Two whistler swans flew past my truck, bound for the Kenai River. Stands of willow next to the glacier were shot with crimson, in anticipation of the coming warm season and the new growth of spring. The first shrill call of a varied thrush, harbinger of summer, echoed across the empty land. Spring in Alaska is a time of rebirth, of the cycles of life beginning anew. This year, the swans somehow made it past the oil slick to return to their summer nesting grounds. As the sky glowed orange, I made a silent promise to those swans. I resolved to make a better effort to tread lightly on the land that we share, so there will still be a safe place for them to nest when they return next year to paradise in the land of the midnight sun.